A Principal's Reflections: Is Technology Being Integrated Effectively? I will definitely have to check out those modules you mentioned Eileen! In either case SAMR provides a great initial lens to look at our practice, but as you mentioned the goal and focus has to be on going deeper. When I think of the term integrating technology the term "further" comes to mind. Just as though digital literacy does not replace traditional forms of literacy. It builds upon the foundation of traditional forms of literacy. It's important that as we teach skills, the integration of technology should dig deeper, more meaningful (relevance). The icing is when you bring in something like global collaboration - these experiences cross cultural and and geographical boundaries. Hopefully as a global society will these things grow into meaningful change that will begin to change our outlook at how we interact with other countries, races, and beliefs. Technology will be how we get there. I couldn't agree with you more Rob! Building on a solid pedagogical foundation is key to success. You also mention so other powerful outcomes that tech integration can support. With out it, the interacting across the globe in real-time would be quite the challenge. - analysis and problem solving with coding and more across discipline & geographical boundaries. So much wonderful potential exists. Thanks for writing such a thoughtful post. I love all of your activities listed Maureen. The challenge for all of us is to not only move the needle when it comes to edtech integration, but to also ensure learning is actually taking place. For many hitting the reset button is a good course of action if success is the ultimate goal. There is so much talk about technology and its importance (especially in our PLN circles), but often little substance of concern for real results. We need to continue to push this important conversation. The infographic depicting students thinking and working as the goal is apropos to our current educational goals. Great article! Thanks Eric for the great article and for sharing the framework. If you're interested we've also created a framework for educational quality evaluations. It's based on defining the product's learning goals and analysing students role using 7 different pedagogical dimensions, e.g. Is student in passive or active role when receiving new information. We've already evaluated Kahoot using our model. We're building a free online evaluation tool also. If you're interested, check www.kokoastandard.com. Thanks for the great article and sharing the framework. If you're interested we've also created a framework for educational quality evaluations. 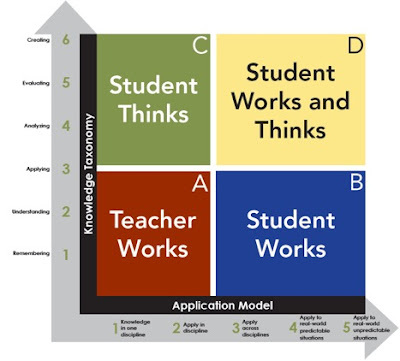 It's based on defining the product's learning goals and analysing students role using 7 different pedagogical dimensions, e.g. Is student in passive or active role when receiving new information. We've already evaluated Kahoot using our model. We're building a free online evaluation tool also. If you're interested, check www.kokoastandard.com. Educators can benefit from utilizing planning time to think about learning outcomes first, then fit in the technology. Technology is a tool not a learning outcome. Here is a Teaching Channel Video that shows students blogging (tool) for the purpose of raising awareness (outcome). Students are not merely "using the computers." They are utilizing technology as a tool to achieve a learning outcome. There is a difference. Thank you, Eric for pushing our thinking and for taking me along this journey of awareness. The best teachers never stop learning. Great post Eric, succinct but powerful. I'd argue though that your starting point is the problem - educators find it hard to reflect on their own practice (well, everyone does for that matter! ), and align the right technology with their needs. It's surfacing those needs that matters - once you can identify what it is you're trying to achieve in the classroom, it's much easier to see the value of tech in that. I focused on this for my own PhD research, and decided that this was a problem of affordances - affordance is after all a relative problem, and it's that relativity between an individual teacher and a tech that is the crux of the problem. I developed something I call AIM models to try and capture those teacher needs - visual thinking tools to capture practice and provoke reflection - more here if that sounds interesting, be great to hear your thoughts: http://catalysed.co.uk/aim_models.html. I agree! There is a certain push and pressure for schools and teachers to implement more technology. After all, students do spend a lot of their time utilizing it so why wouldn't education integrate it more? Technology is extremely vital in today's classroom. Technology has the power to engage students and to enhance lessons. However, as a fairly new educator I understand the pressure to implement technology that may not be as effective as we think. My first year of teaching I was bombarded with implementing the SmartBoard, and Ipads, and engaging review games. However, I did not truly see much evidence how rigorous or effective a lot of these types of activities were. I have a better understanding on how to effectively utilize some of the technology that is available, by my own research and exploration. Districts need to implement more training on how to effectively integrate technology in the classroom. It can be overwhelming dealing with the pressure and expectations to use tech and not know exactly how to do so. This frustration can lead to implementing technology in ways that may not be as great as we think. Overall, technology is wonderful, and opens so many doors in education. However, more research, exploration, and training needs to be done to ensure it is integrated correctly to ensure academic success.